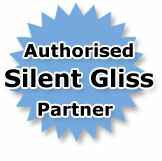 You will find nothing but 100% genuine Silent Gliss products here. Haywoods Contracts, the company behind DiscountElectricCurtains.co.uk, have a solid relationship with Silent Gliss and have been partners with them for over 20 years. This gives us access to Autoglide tracks at fantastically competitive prices, straight from the manufacturer.